“Look up there, a friend is watching,” Aboriginal Guide Neville pointed high in the Arnhem Land Escarpment, in Australia’s Northern Territory. I’ll never forget those words. Casually, almost an afterthought, Neville showed me someone I had been waiting and working for years to see. 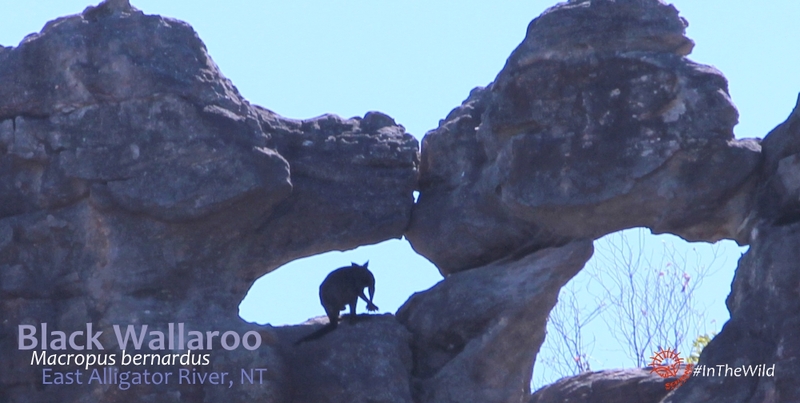 Framed by Arnhem Land sandstone, right at the top of a perilous cliff, a kangaroo dozed. He had a big head and small ears. He was a Black Wallaroo: Australia’s rarest kangaroo*. He was magnificent, aloof, like a Jedi Master waiting patiently for me to learn a valuable life lesson. To understand his lesson, you have to come back with me a few years….. In August 2011 we were sharing our dinner table at Anbinik, in Kakadu, with a lovely family from Sydney. They were telling us about their day. As usual, we asked what wildlife they had seen. “We saw a black kangaroo at Nourlangie.” Our ears pricked up. “We have a picture.” !!!!!! OMG, they were right. They had seen one of Australia’s rarest kangaroos* and they didn’t even know it. More frustrating, we had been there earlier that morning and had seen no sign of him. The Black Wallaroo is a very special kangaroo. 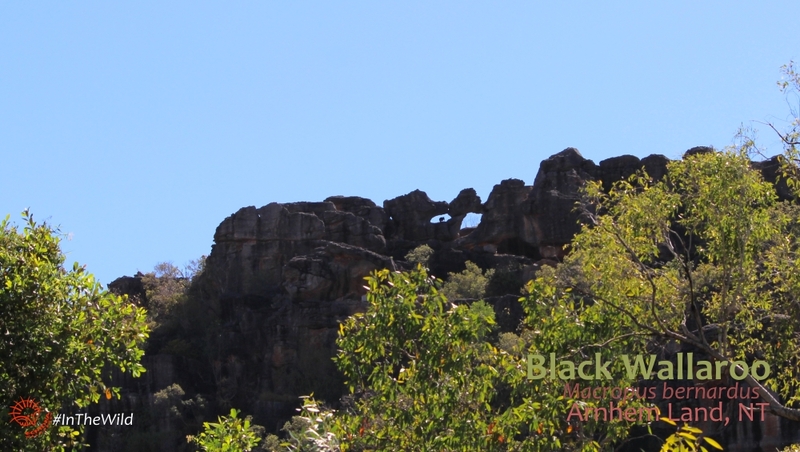 They have a very restricted range – the Arnhem Land escarpment in the Top End of the Northern Territory. They are chunky, and a bit shaggy-furred like most wallaroos*. Only the male is black, the female is golden-tan and could be easily confused with the other three large macropods in the region – the Agile Wallaby, Common Wallaroo and the Antilopine Kangaroo. I did my research. 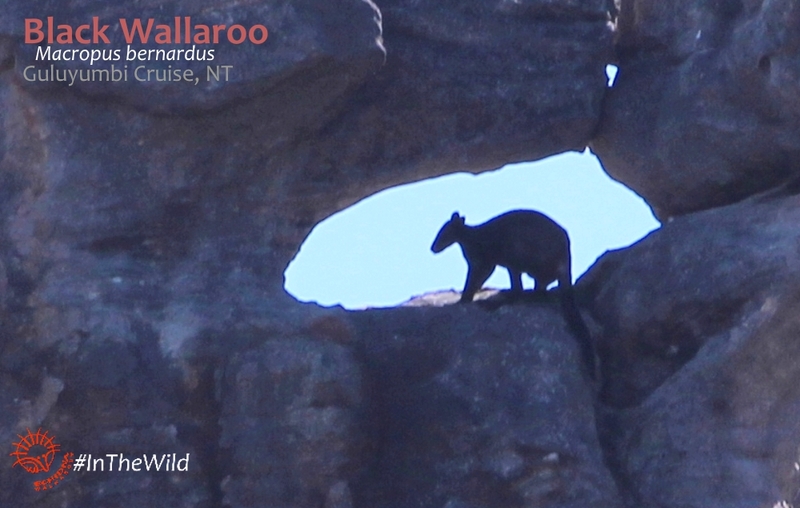 Sure enough, the Black Wallaroo is seen quite frequently at Nourlangie Rock Art site. On subsequent trips I tried everything to find him. I arrived at Nourlangie early, in the quiet of the day before the bus tours arrived. It was beautiful. We saw Partridge Pigeons, Banded Fruit-doves, Little Woodswallows, Emerald Doves….. but no Black Wallaroo. Read about other wildlife we see in Kakadu here. I heard reports from other travellers at Nourlangie: “a big wallaby just hopped past.” I interviewed them like we were on Crime Stoppers: “Describe him please. What colour, what size?” They co-operated, but most weren’t used to describing macropods, and couldn’t give me much. I even heard him hopping once. Two big, quite heavy hops behind me. I turned fast, but he’d already disappeared into the monsoon forest. The Black Wallaroo started to become my bogey-kangaroo. You would be forgiven for thinking he was avoiding me. But I was not meant to see him at Nourlangie, all by myself. He was teaching me an important lesson. Nature is not like maths. There is no formula for luck, for synchronicity, for the combination of the right people at the right time. The Black Wallaroo waited for me in Arnhem Land. A Traditional Owner showed me, and in doing so, demonstrated his connection to country, and the wildlife that thrives because of that connection. 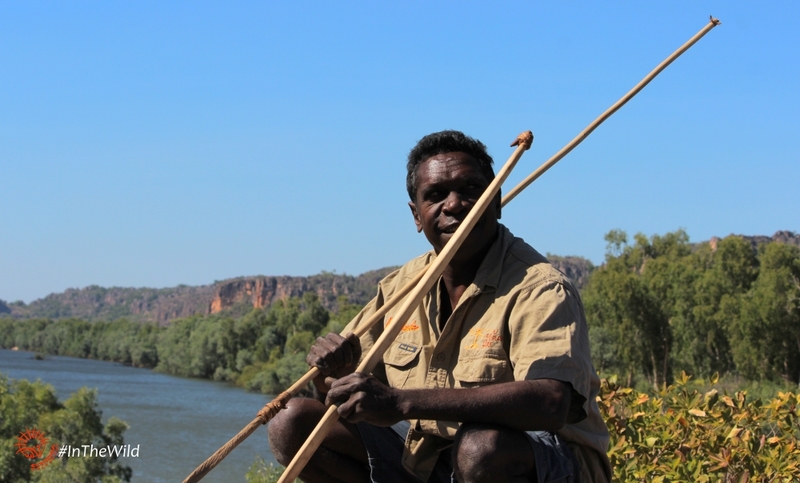 We highly recommend the Guluyambi Cruise run by Traditional Owners on the East Alligator River. Read more about Black Wallaroos here. Read about another macropod of Kakadu – the gorgeous Wilkins’ (Eastern Short-eared) Rock-wallaby. *The Black Wallaroo: Australia’s rarest kangaroo. Conservation Status of Black Wallaroo is Near Threatened by the IUCN Red List, due to small range, small population size and not much data on population trend (ie whether declining or increasing). There are other, rarer macropods – the Bridled Nailtail Wallaby is Vulnerable, the Parma Wallaby is Near Threatened, but they are wallabies.